Jori Versus KFC Tower Burger... Who wins? Last week I was challenged if I can demolish a single KFC Tower Burger. Of course, I accepted the challenge immediately. But I didn't know there is a catch... I must finish it in 2 minutes. Wow!!! Even to somebody like me who can really consume a great amount of food is not very sure if I can consume it in less than 2 minutes. But then again I trust my instinct and accepted the challenge. So who do you think won? Oh well, I think I'm not worthy against KFC's Tower Burger. Buy one KFC Tower Burger. - The video is not edited, cut, or spliced together. After the successful upload, get the YouTube URL of your video and enter it into the KFC Demolish the Tower Facebook app, together with your name, mailing address, email address, and mobile number. Deadline of uploading of videos is on September 16, 2011 (12 midnight). 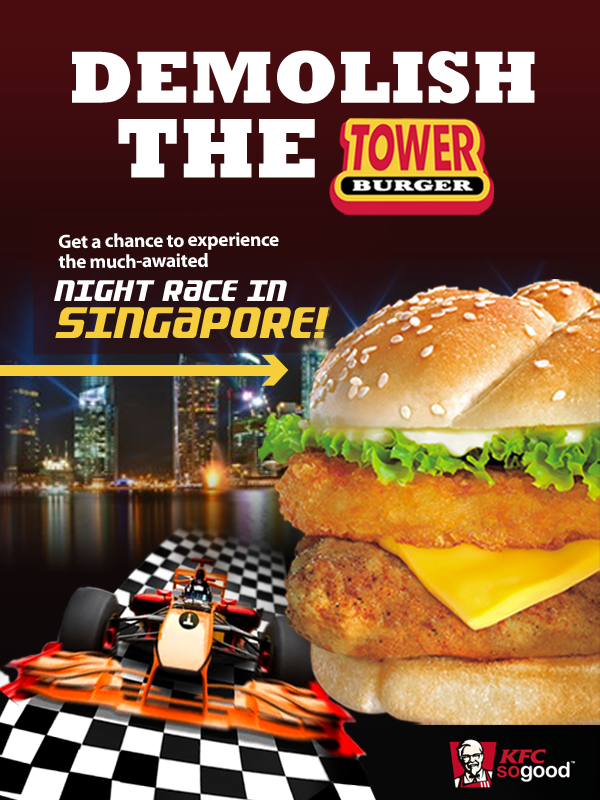 So what are you waiting for, go to your nearest KFC branch, grab a KFC Tower Burger and shoot your challenge and you might be the lucky one. haha! I know someone who will like to take this challenge, and we were planning on something similar too… he'll love this one since there's a reward if he wins the challenge. hahaha grabe bilis nyo kainin yung tower burger ng kfc ah! di ko ata kaya. hahaha!